The American military buildup comes amid calls by President Donald Trump for new plans to accelerate the pace of the war against the Sunni Muslim extremists. 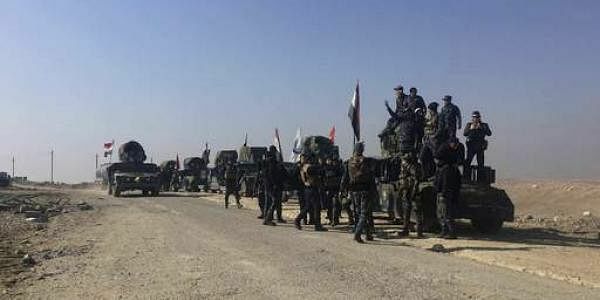 MOSUL: Iraqi forces advanced on the Islamic State group in west Mosul as the United States nearly doubled its troops to help defeat the jihadists in their Syrian stronghold Raqa. The US-led coalition fighting IS said the United States was deploying another 400 troops against the jihadists in their self-proclaimed capital in Syria, joining 500 already on the ground. "They are temporary forces," coalition spokesman US Colonel John Dorrian told reporters in Baghdad, adding the long-term authorised level of American troops in Syria would remain at 500. The announcement came as the State Department said the United States would host a meeting of the 68 members of the coalition fighting IS on March 22. The American military buildup comes amid calls by President Donald Trump for new plans to accelerate the pace of the war against the Sunni Muslim extremists. IS jihadists are facing simultaneous offensives in northern Syria by government forces, Turkish-backed rebels, and a US-supported alliance of Kurdish and Arab fighters. In the latest sign they are feeling the squeeze, their chief Abu Bakr al-Baghdadi was reported to have abandoned Mosul, leaving local commanders behind to fight the Iraqi forces. "He was in Mosul at some point before the offensive.... He left before we isolated Mosul and Tal Afar," a town to the west, said a US defence official. "He probably gave broad strategic guidance and has left it to battlefield commanders." Baghdadi, who declared IS's cross-border "caliphate" at a Mosul mosque in 2014, in an audio message in November urged supporters to make a stand in the city rather than "retreating in shame". Iraq launched the offensive to retake Mosul -- which involves tens of thousands of soldiers, police and allied militia fighters -- in October. After recapturing its eastern side, the forces set their sights on the city's densely populated west. In recent days Iraqi forces have retaken a series of neighbourhoods and a museum where IS militants filmed themselves destroying priceless artefacts. Iraq's Joint Operations Command announced yesterday the elite Counter-Terrorism Service recaptured the Mualemeen neighbourhood in west Mosul.